Houston, Texas – September 3, 2014 – South African Summer Citrus has expanded its arrival destinations with a pilot program to include the Port of Houston. A shipment of seven containers has been successfully received there and will be followed by another four containers scheduled to arrive on or around September 9th. Both shipments contain navel oranges. “We are very excited about this expanded program to the US,” said Suhanra Conradie, CEO of the Western Cape Citrus Producers Forum (WCCPF). “It has been our plan to better meet the need of importers as well as retail stores in the mid- and far west points of the US.” The WCCPF is a consortium of some 230 growers approved to export citrus from South Africa to the US. South Africa is the second largest exporter in the world of citrus, next to Spain. The Port of Houston was selected for its location and state-of-the-art facilities used to inspect the fruit on arrival. “Houston is an excellent gateway and provides a central location enabling greater efficiencies of time and cost,” said Ms. Conradie. “It offers us the capability to serve the market needs of the entire Midwest area from Houston to Chicago, and points west.” Houston is the largest container port on the Gulf Coast and the seventh largest container port in the US. On arrival, the citrus undergoes the standard rigorous inspection conducted by the USDA Animal Plant Health Inspection Service (APHIS). Citrus from South Africa is inspected by USDA APHIS as well as South Africa’s Department of Agriculture, Forestry & Fisheries (DAFF) prior to leaving the Port of Cape Town. Capespan North America and Seald Sweet are the two importers receiving the fruit from the shipments to Houston, with Capespan North America receiving the majority of it. Capespan North America along with Bruce McEvoy, USA Representative, South African Citrus Growers Association (CGA), has been instrumental facilitating the Houston program. South African Summer Citrus complements the domestic citrus industry from June through October when US grown citrus is less available. 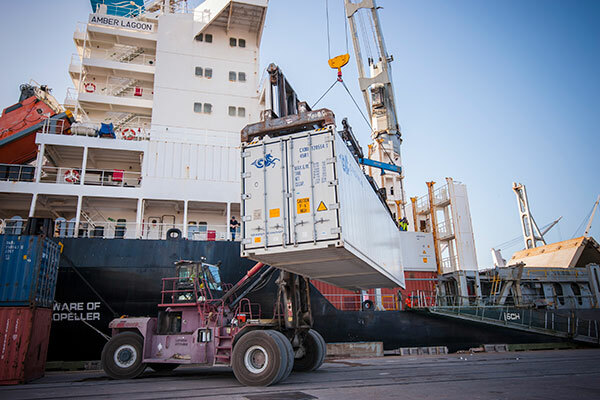 In its 15th year, South Africa exports +/- 42,000 tons of citrus each year to the US in both containers and conventional refrigerated vessels to the Port of Newark (containers) and the Port of Philadelphia at Gloucester City, NJ. Varieties include Clementines, Navels, Midknight Valencias and Star Ruby Grapefruit.